War drama follows a Navy SEAL's attempted rescue of a doctor stranded in the Nigerian jungle. 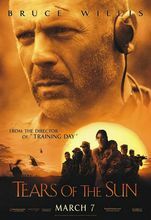 A democratically-elected government in the fragile African republic of Nigeria gives way to a fearsome military junta, bringing Navy SEAL lieutenant A. K. Waters and a team of top-flight specialists on the scene to retrieve American-citizen Doctors Without Borders physician Lana Kendricks from a remote village deep in the Nigerian jungle. The idealistic Kendricks demands the transport of a number of villagers to political asylum near the border before she agrees to leave, forcing Waters to choose between strict orders not to accept any refugees from his commanding officer and Kendricks' wishes as soldiers from the junta's army close in.